This solid-looking structure appears to be made out of plastic—or some equally sturdy polymer. But get a little closer, and you'll find it's made of... salt? Using a standard powder-based 3D printer, they and their students have figured out how to print bricks, components, and furniture using recyclable materials... The salt looks like "solid milk," to borrow Rael's words. Shockingly, it's all super strong, thanks to reinforcement techniques developed in-house—their printed cement is actually stronger than standard stuff. But most importantly? It's 90% less expensive that current 3D printing technology. 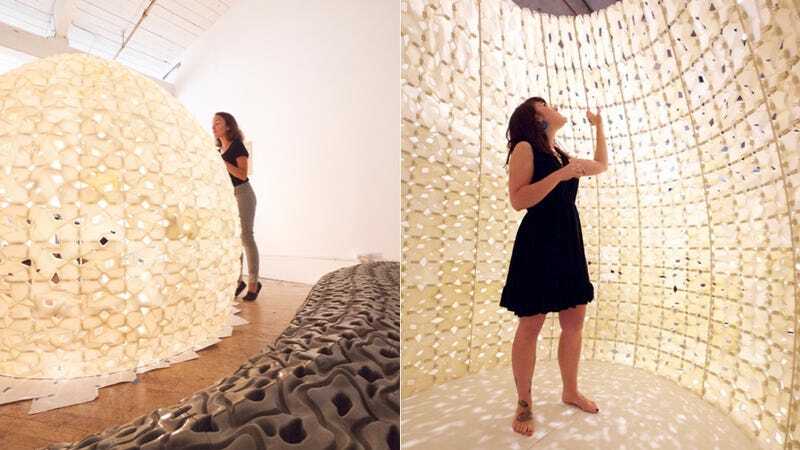 Each panel recalls the crystalline form of salt and is randomly rotated and aggregated to create a larger structure where all tiles in the structure are unique. The form of the Saltygloo is drawn from the forms found in the Inuit igloos, but also the shapes and forms of tools and equipment found in the ancient process of boiling brine.